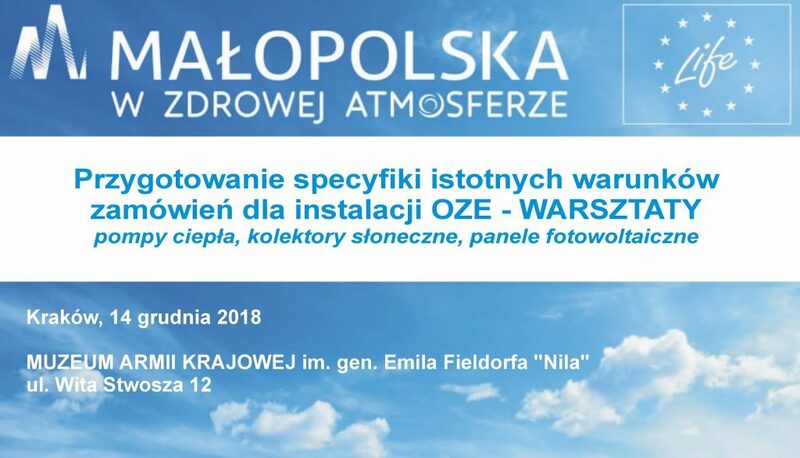 On Friday, 14 December 2018 at the AK Museum (Wita Stwosza 12, Kraków) will be a workshop for employees of municipalities in the scope of preparation of the terms of reference (ToR) for renewable energy installations (heat pumps, solar collectors, photovoltaic panels). The workshop will be conducted by specialists from the Center of Sustainable Development and Energy Conservation “Miękinia”, Polish Heat Pump Development and Technology (PORT PC) and the Photovoltaic Industry Association. Due to the limited list of places, registration is required. If you have additional questions, please contact Ms Justyna Mazurkiewicz (justyna.mazurkiewicz@umwm.pl, phone: 12 37 96 083). Workshops are carried out as part of the LIFE integrated project “Implementation of the air quality plan for the Małopolska Region – Małopolska in a healthy atmosphere”, aimed at improving air quality in the region (action E.3 – “Creating a network for exchanging experiences with other projects”).